Jewish Chamber of Commerce President Dror Atari and Philippine Ambassador to Israel Neal Imperial aim to strengthen Israeli-Filipino ties with business ventures. Even before Israel became a state, it has always had a positive relationship with the Philippines. It started in the 1930s, under President Manuel L. Quezon, when the Philippines granted visas to Jews and opened places for them to settle during the war. Cooperation between the two countries continues to prosper as years pass, and their relationship now covers different aspects –culture, politics, economics, science and technology, and business. 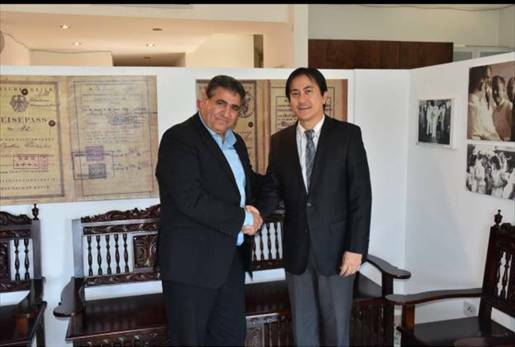 Recently, the Philippine Ambassador to Israel, Mr. Neal Imperial, and Jerusalem Chamber of Commerce President Mr. Dror Atari met to discuss business opportunities that will enhance both countries’ economies. They discussed ways to develop and expand the cooperation by working towards identifying the needs of the business communities in the two countries. The meeting – the first working meeting for Mr. Atari – was set to discuss various programs that would help create and promote opportunities for business in various fields, particularly tourism, technology, and agriculture. Judy B. Razon, vice consul and third secretary (economic attaché) headed the team from the Philippine Embassy in Israel. Mr. Imperial pointed out that the Philippines is undergoing changes in its economic policy, and that there is a need for investors in trade, tourism, real estate, and agriculture. He emphasized that business and investment opportunities in the country await Israeli businesses. One of the industries he highlighted is the Information Technology-Business Process Management (IT-BPM), which generated about US$22 billion in revenue last year and more than 1.1 million jobs. The industry is a major growth component of the Philippines. He added that Israeli companies could benefit from lower labor costs and improved competitiveness by working with Filipino BPO companies. He also noted that the air services agreement both countries signed, as well as the two-way tourism cooperation being developed will drive business connections. According to Mr. Atari, the cooperation between the two countries will be beneficial on both ends. He pointed out that the way the Asian economy affects the world now becomes an important business channel for Israelis. The Philippines serves as their gateway to the larger market of Southeast Asia, he said. The Israeli and Philippine professional teams came up with joint initiatives to promote trade and tourism in Jerusalem, and various solutions to deepen industry knowledge, such as conducting training courses.